Planning a wedding at The Ivory Room is made easy with the on-site event staff with every detail arranged through Cameron Mitchell Premier Events including limousines, flowers and valet parking. Each and every event is considered a customized affair, therefore there are no bar minimums to maintain or pre-set wedding packages. The event space can accommodate both a ceremony as well as a reception area with a dance floor/entertainment space. Theatre-style seating can set up in a number of areas, allowing for up to 200 guests to attend the ceremony. The event space can also hold up to 300 guests for a plated event, with tables arranged in a variety of ways. There are also additional areas that can be created for cocktail receptions. Included with each wedding, The Ivory Room provides a private suite which includes a spacious bathroom and a high-tech audio system. The main event space also features a state-of-the-art audio-visual system allowing for first-rate entertainment capabilities. Parking is available right next door at the Miranova garage or valet services can be arranged. According to Cameron Mitchell Premier Events, pricing minimums for events held at The Ivory Room begin at $4,000 and go up to $28,000, depending on the day and time of year. These minimum charges are based on the rental of the facility, food and beverage pricing, event staffing and other service charges. Wedding couples have use of the entire facility for up to six hours. "All Day" blocks are also available for up to 7 1/2 hours. Food pricing is estimated to cost between $21.95 to $42.95 for a buffet dinner or $19.95 to $54.95 for a plated entree. A stations menu can also be arranged and costs between $27.95 and $44.95. Two bar options are available as well, including the Ivory and Prestige, which offers pricing based on beverage choices. A 25% service charge is added to the food and beverage bill which covers use of china, linens, tables, chairs, flatware and all glassware. Style and Story can help you capture every moment of your special day, from the rehearsal dinner to the last dance. For more information, please contact us. As Ohio's state capital and most populated city, Columbus has all of the benefits of a large city yet retains a small town charm. The convergence of the Scioto and Olentangy Rivers in Downtown Columbus creates a majestic waterway that has spurred a scenic and bustling riverfront. One of the highlights of the riverfront area is the Scioto Mile, a 33-acre park project completed in 2015 that spans from Bicentennial Plaza to North Bank Park. At the heart of this scenic spot lies The Ivory Room, one of three event spaces managed by Cameron Mitchell Premier Events. Open since 2012, The Ivory Room is located on the sixth floor in the stylish Miranova Place building. 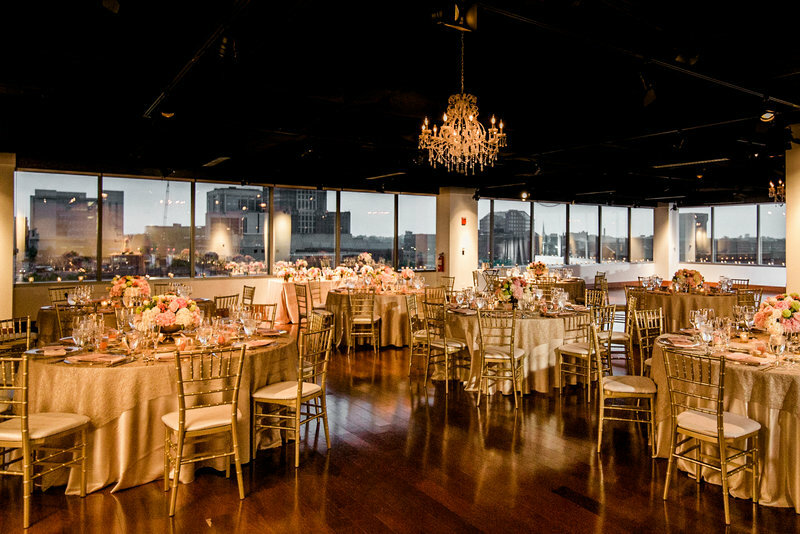 Spacious and upscale, The Ivory Room offers unparalleled views of the Columbus skyline with an expansive row of windows that carries across two of the room's walls that face the river. Elegant and sophisticated, The Ivory Room is a blank slate ready to be transformed into a dream wedding venue. The space gives off a loft-style vibe and is a dichotomy of industrial and sleek with exposed ductwork that has been painted black and is adorned with sparkling chandeliers. With the expertise of the experienced staff, wedding couples have the security of knowing that all of the guesswork has been taken out of the wedding planning. Under the staff's guidance, The Ivory Room can be customized to any theme or style. 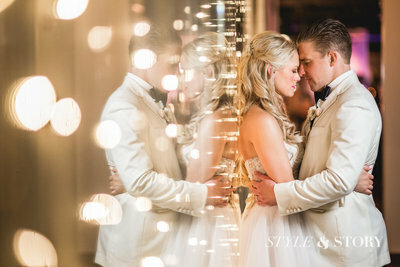 Click to see Meagan & Andrew's incredible wedding at The Ivory Room. 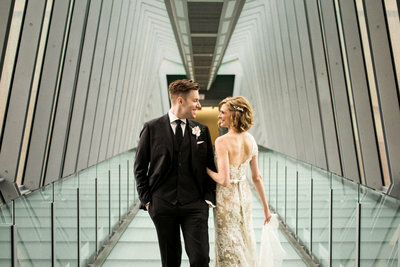 Click to see Katie & Sam's incredible wedding at The Ivory Room.